The bundled Cinder source files includes documentation that you can view locally. You can find the online version here. If you are cloning the Cinder GitHub repo, the docs will need to be generated in your cloned local repo. This is a 2-step process. 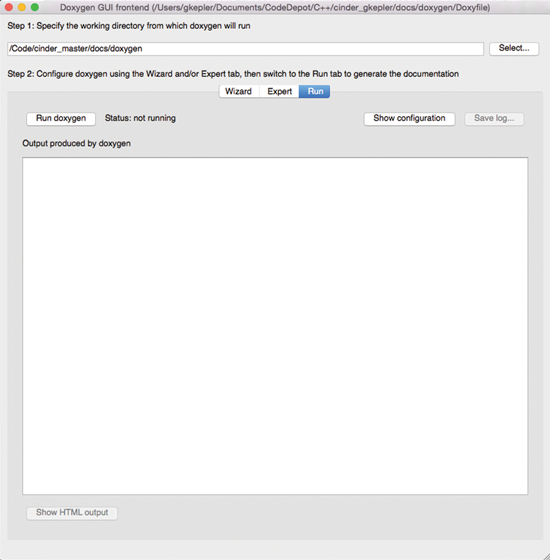 Cinder uses Doxygen in part to generate documentation from the cinder_docs source files. You can generate the Doxygen output and tag file using Doxywizard. The Cinder latest release uses Doxywizard 1.8.10. You can download Doxywizard here. Use the File | Open... menu item to open docs/doxygen/Doxyfile. This step builds out a directory of xml files and a cinder.tag file. This next step generates the documentation from newly generated Doxygen output. It requires that you have python 2.7.x to run it. This process generates HTML files in the Cinder/docs/html directory. If the python file throws an error that results in incomplete docs, you can file a GitHub issue here.